Our mission for the past 40+ years has been to serve our Southern California clients with complete kitchen air control and fire prevention services. We are so proud to have the opportunity to help make Southern California kitchens safer and cleaner every day. Our services include complete kitchen exhaust system cleaning (including hand scraping and steam cleaning), cleaning of fans, hoods, and ducts, grease filter exchange service, swamp cooler maintenance, exhaust fan maintenance, automatic fire suppression system maintenance, and portable fire extinguisher sales and service. We are proud members of the California Restaurant Association, International Kitchen Exhaust Cleaning Association, and the National Fire Protection Association (NFPA). But what does this all have to do with firefighters? You might ask. Why would a firefighter care what Flue Steam does each day? It’s because Flue Steam makes firefighters’ jobs MUCH easier! According to the NFPA, kitchen fires are one of the most common accidents in the US. Though they’re still relatively uncommon at this point, it didn’t always use to be that way. Back in 1971, when our company was founded, heath and fire codes governing commercial kitchens began to be enforced more strictly when the government realized that fire accidents could be avoided if more restrictions were imposed. When that happened, though, many business owners and managers started struggling to meet all the requirements and attend to all the usual important matters. Flue Steam grew out of that need to meet all the requirements and help restaurants stay in businesses successfully. We continue this same work today, over 40 years later, and many of our clients have relied on our services for decades. We value each customer very much, and we always strive to exceed their expectations with our high standards. Not only do we make firefighters’ jobs easier so they won’t have to run all over town putting out kitchen fires all over the place, we also make your job easier. Whatever your responsibilities are, you can handle them with so much more focused dedication when we take care of all your kitchen air control and fire prevention services. Focus on what’s most important to you, and let us handle the less-exciting, but still vitally important, aspects of your kitchen. 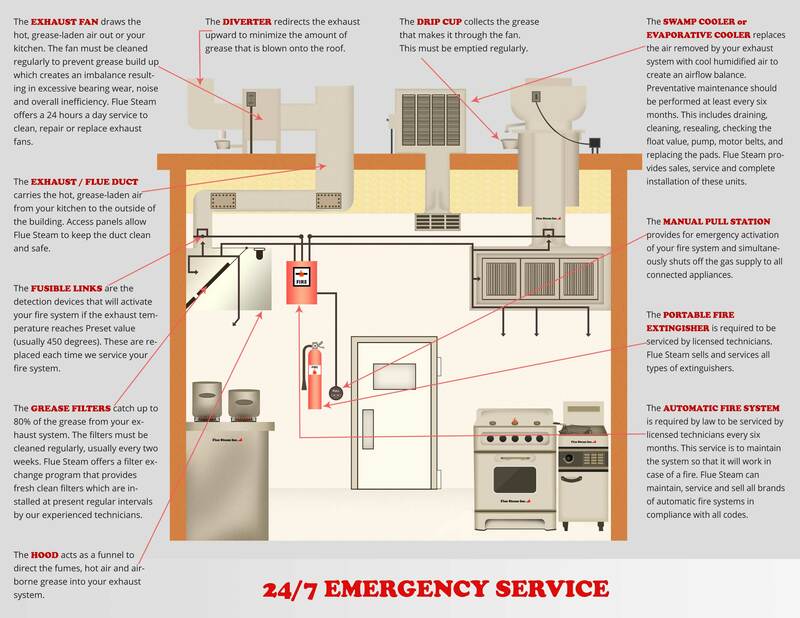 We also offer excellent emergency service 24/7—just call 800-700-FLUE and one of our company trucks will be right on ever to help you out immediately, no matter what time of day or night it may be. Call 800-700-FLUE, email contact@fluesteam.com, or send us an online message here to discuss your kitchen’s needs and set up a regular maintenance schedule. You’ll feel so much peace of mind when you hire the experts at Flue Steam to handle your kitchen air control and fire prevention services every day. We look forward to establish a lifelong professional relationship with you!